Boomerang Buyers-Default,Deed-in-Lieu,Loan Mod,Short-Sale, Foreclosure, or BK’s? Keller Williams Information, Mike Is talking Again!, Open Houses This Weekend! Open House THIS Sunday, February 21st 1 to 4pm ! 1200 Halyard Drive, Santa Rosa,Ca 95401 Traditional Beauty. This stunning traditional home is back on the market and OPEN this Sunday–All reports NOW on file! 4 bedrooms and 3 FULL baths the home has 3 bedrooms upstairs and one bedroom down wit adjacent full bath and exterior door–perfect “Multi-generational” living or for guests who savor their privacy. Kitchen new flooring in a rich brown with matching entry statement. Home is over 2100 sqft and has enormous living room with adjoining Dining area big enough for your Grandma’s sideboard, hutch and dining table and chairs. A big sectional would be swallowed up in the living room. Kitchen has newer appliances, flooring and is adjoins the family room with fireplace. Breakfast bar serves your hurried mornings or quick lunches. Yard has gate for ez acess and patio for al fresco dining. Priced to sell at: $560,000. Join Allison THIS Sunday, February 21st from 1 to 4pm. Buyer Updates and News!, Country Property Discussions, Homeowners, Mike Is talking Again! “Where’s the Beef?” Sales are flat, Inventory Short. Sonoma County selling and buying season here in the lovely “Wine Country” just an hour north of the “Gate” is flat with sales down 2% over last year but the bigger issue–Inventory! Usually March will signal the beginning of the “Selling” season by more homes coming onto the marketplace. March was a GOOD month but instead of being the beginning of an inventory surge–it was the end. March was our best month and inventory has been declining since. WHAT are the reasons? 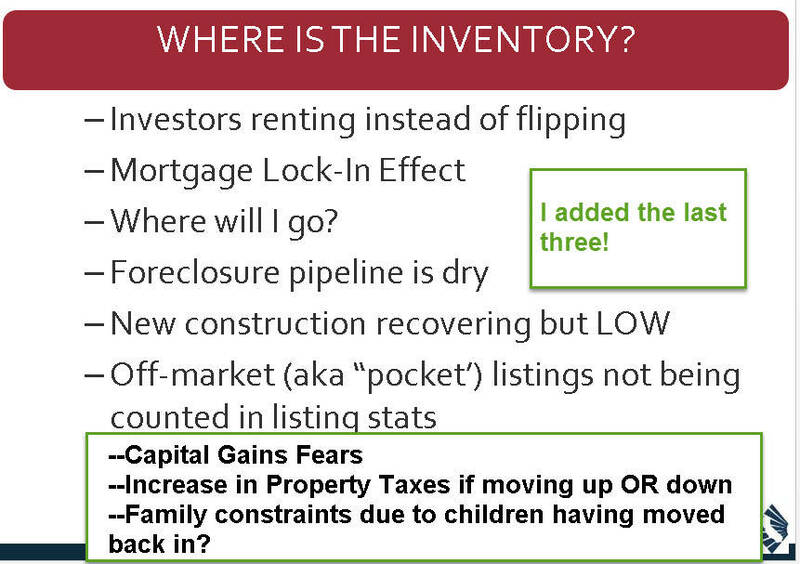 Below is a slide from the California Association of Realtors. I’ve added on the last three. I think the “Off Market” or “pocket listings” is an issue but I’ve NOT seen any hard numbers on it. I’m waiting for CAR or perhaps Core-Logic, to come out with a study showing MLS sales vs. recorded sales. I know in our super tight inventory market, Realtors/Agents are always asking to see new listings not yet on the market. We hear of sales being made off MLS all the time. I keep waiting for the law suit which will define this isssue to apppear. Sellers and their Realtor/Agents who state, “They got their price.” really have no idea at how much that “price” could have been! The current disclosures by CAR, reflect this very issue which came out of the ’89 market scarcity. Here in Sonoma County, California the real estate market is dealing with Homes attracting Multiple Offers from Buyers. Here are Buyer techniques you might wish to try to standout from the other offers. My last column addressed recommendations and a method of dealing with multiple offers from the homeowner’s perspective. Many of the buyers we are currently assisting asked, “Hey, what about us?” The big difference between the Seller and Buyer is the SELLER will reach their goals in quick order. Buyers, however, may be making an offer on their 5th property and getting a trifle disgusted with the process. Let us explore those strategies and tips we use with Buyers. June 2 , 2013; Santa Rosa, Ca. The change in the Sonoma County Real Estate Market was upwards of 60% in some areas of the county, from the height of the market in 2006, to the bottom in 2009. But, in some Sonoma County cities homes have managed to hold their value amazingly well. On today’s show we’ll tell you which areas, and why….. The Forgotton Entrance – Is your Front Door Welcoming? Sunday, May 26, 2013 – Sonoma County, Ca. Creating a welcoming front entrance can add to your home’s curb appeal, desirability and value. Your front door is the first impression your visitors (and potential buyers) get of your home. Make sure it’s a good one. Welcoming; Your guest begin developing an opinion of your home as soon as they pull up to the curb. Light; Not just the front door, but also the path leading them there. Safe; High fences and tall bushes can become a hiding place behind which to lurk. Make sure your guests feel safe at your front door. Start at the curb. look at your entrance. Walk the path your guests will use several times and think about the experience. Is it Welcoming, Obvious, light and Safe? If not, make some changes. This Week’s Show; Wildfires are Coming…Is Your Home Ready? Fire Prevention Battalion Chief, Ben Nicholls, joins us on the radio to discuss the steps homeowners in High Fire Areas (State Responsibility Areas, SRAs) should be taking to protect their homes from Wild Fire. Also, great tips for everyone on fire safety in your home. Join us at 9:15 for this informative and very important topic. Sonoma County, California Home Sellers AND buyers–get out of the Appraisers way! Let me start by saying there are many really good appraisers. Unfortunately, not all home appraisers are created equal. Some make a genuine effort and others are just in a hurry to get this appraisal done and move on to the next one. Some come from out of the area, and they’re not familiar with your particular neighborhood, and how it compares to the others nearby.. Low appraisals can be a real problem as scarcity of homes and multiple offers are driving up prices. There are pockets and micro communities. If you step off the curb, you’re in a different zone. So make sure your appraiser knows that just because you’re in one district doesn’t mean you’re in the same neighborhood as the places 3 miles down the road. If you provide the appraiser with three solid and well-priced comparable properties, you will save them time as well as ensure that they have appropriate comparables rather then having them randomly pick some from the neighborhood. Kitchens and bathrooms get the most value. However, wood floors, landscaping and enclosed garages also increase appraisals. You’d want to do this for tax and insurance purposes. But if the records are a little haphazard, take some time and organize it into different file folders, and make them available for the appraiser. Has your town gotten any award, or award winning restaurants, museums, parks, colleges, etc? Make your community seem vibrant as it will increase the perceived value of your home. If you’ve remodeled and completely finished a basement or an attic, you will need to point that out to the appraiser, as these are often not counted in the square footage, and therefore the final appraisal. Clean up and declutter where you can. Put flowers out. Have cookies baking. Make your home seem clean, upscale, and organized. If you follow the appraiser around, they’ll be more focused on you then on the home, so let them know where you are if they have any questions. 90 Energy Upgrades await you Freezing Sonoma County Homeowners! County Financed! 90 Energy Upgrades can be financed through Sonoma County! Click on the Facebook icon immediately following this sentence and check out their page and make sure you LIKE THEM! Get more information on energy upgrades and how the County of Sonoma can make this happen for you! Holiday Halt for Foreclosures, BUT, Is your loan owned by Fannie or Freddie? In Sonoma County, Ca., most “bubble” loans (loans originated 2004-2007) were not sold to Fannie or Freddie. However, double check with the sites below to see if your loan is owned by Fannie and Freddie. If you are in foreclosure, you may have a holiday delay in the sale of your home. The links below will help you figure it out. All about Septic on this week’s show with Mike Treinen! Steven wowdiloski on Bay Area Air Quality Management District is Proposing a Point Of Sale Mandate for Wood Burning Fireplace/Wood Burning Device Replacement to EPA Standards.